AUSTIN, TX (December 29, 2015): David Weekley Homes celebrated its first new homeowners in Forest Grove with a red carpet welcome that included a special dessert. David Weekley Team Members also surprised Marlo and Bryan Youde with a special gift in honor of their interest in bird watching. “We are very excited to have Marlo and Bryan move in to their new home in Forest Grove and wanted to do something to welcome them to the community,” says Dave Mire, Division President in Austin. Forest Grove offers outdoor recreation at Old Settlers Park and Brushy Creek Regional Trail and students attend Round Rock ISD schools. In addition, residents have easy access to nearby shopping, dining and entertainment at La Frontera and Round Rock Premium Outlets. Priced from the $575s, floor plans range in size from 3,072 to 5,150 square feet of living space. Homebuyers can see firsthand what the home builder has to offer by visiting The Brosnan model home, now open daily for tours at 3005 Alton Place in Round Rock. This one-story home offers five bedrooms, six full baths, one half bath and a three-car garage. The Brosnan also features a courtyard, study with an option for a bonus room on the second floor. 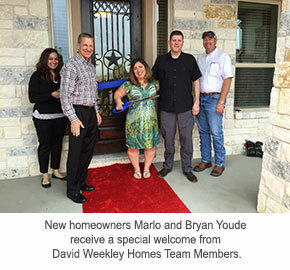 For information about David Weekley homes in Forest Grove, homebuyers may call 512-821-8873 or visit www.davidweekleyhomes.com.